Good morning! Today's going to be a long day full of meetings and paperwork, but fortunately one of my sales reps is taking me and some of the work crew out for a business expensed "work" dinner at a new highly rated restaurant. There may or may not be a coincidence that it's a few days after my birthday. I may not like aging another year, but I sure do like to celebrate my special day as many ways as I can! I learned a new technique today from Fashion Polish, and that's how to minimize brushstrokes with frosts, metallics, chromes, and foils. I'm glad to find an easy solution to those unwanted brushstrokes, and that's by using a layer of matte topcoat before the final topcoat. How easy is that? My first test subject is I Love Nail Polish Reminisce, a duochrome green shimmer that has that glow within property, shifting from dark forest green to an emerald green. True to ILNP formula, I used three fluid coats for opacity and it dried with the expected brushstrokes, despite how carefully I applied it. I used a layer of Wet 'n' Wild matte topcoat and finished with my standard GCS/Poshe mix. I have to say, there was a visible improvement but if you look hard enough, you can still see some of the marks. The duochrome effect with Reminisce isn't terribly strong, so some may be disappointed if you were looking for a bold color morph. In some lights you may catch a hint of teal, but it's elusive and brief. The gradients of green fortunately create a glowing effect which is enchanting. And matte topcoat=Winning! I have another reason to love matte topcoats, and another excuse to stock up. Whodathunk matte topcoat would clean up frosts so beautifully? Have you tried this trick yet? Or do you have another matte topcoat trick that you'd like to pass along? 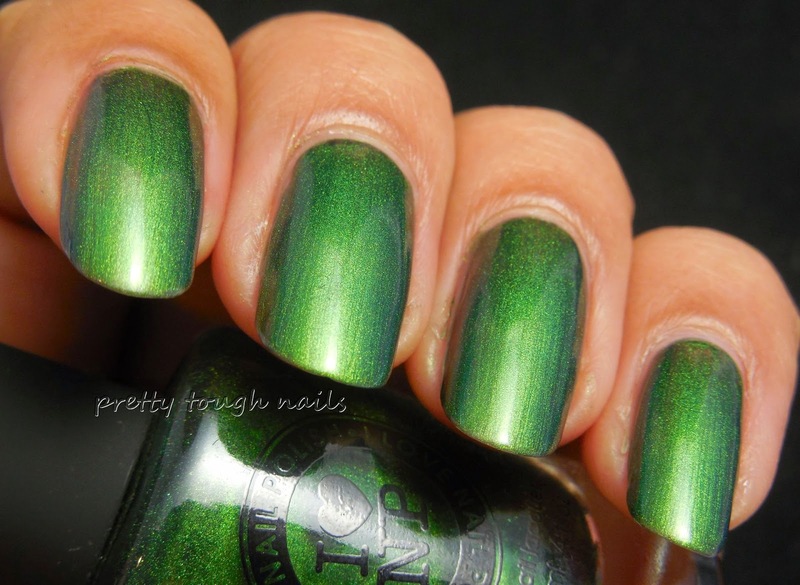 Even if it's not the most shifty multichrome in the book, that green is GORGEOUS on you!